Some pertinent, details of British Orders, gallantry and campaign medals awarded to Czechoslovak airmen during WW2. Fuller details of each medal regarding non-RAF and pre-WW2 / post-WW2 usage can be found on wilkepedia or other resources. Medals listed in descending order. Medals are worn on the left side of the recipients chest. The most important medal, or senior medal, is worn on the right of the group. If a number of medals are worn they are often overlapped or mounted on a backing piece, this is known as court-mounted. Valour medals, awarded for bravery, are given greater importance over campaign and service medals. A list of Czechoslovak airmen awarded Orders and Gallantry medals can be found here. The Most Honourable Order of the Bath has a military and civilian division. The Order has three levels in each division: Knight Grand Cross (GCB); Knight Commander (KCB); and Companion (CB). The Order is the fourth-most senior of the British Orders of Chivalry. Inclusion in the Military Division, regarded as the highest class of British military honour obtainable, is governed by rank. The first two levels confer knighthood. The Companion level was presented to the military for service in the Second World War one of its recipients being Air Marshall Karel Janoušek. The Order has a Civilian and a Military Division and appointment of females is possible. It is mainly awarded to senior military officers for services in action and to people who give distinguished service at senior levels in political and government service. Male recipients wear the Commander’s star on the left chest, with the badge suspended from a necklet. The military badge is a gold Maltese Cross of eight points, approx 55mm x 48mm, enamelled in white. Each point of the cross is decorated by a small gold ball; each angle has a small figure of a lion. The centre of the cross bears three crowns on the obverse side, and a rose, a thistle and a shamrock, representing England, Scotland and Ireland, emanating from a sceptre on the reverse side. Both emblems are surrounded by a red circular ring bearing the motto of the Order “TRIA JUNCTA IN UNO'(Latin for “Three joined in one”), a reference to the union of England, Scotland and Ireland and symbolised by the three crowns of the Order. This in turn is flanked by two laurel branches, enamelled green, above a scroll bearing the words ICH DIEN (old German for “I serve”) in gold letters. The badge has a reverse that is similar in appearance to its obverse. 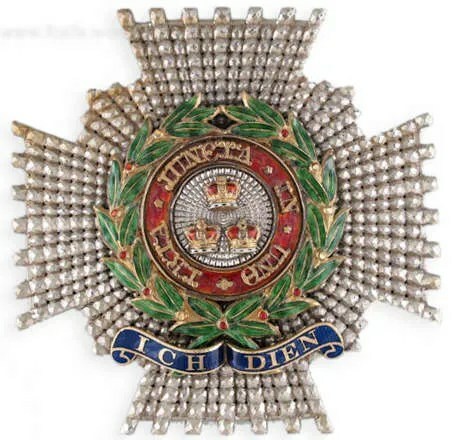 The Breast Star of the the Commander is an eight pointed star formed by two Maltese crosses The center disc features a red circular ring bearing the motto of the Order “TRIA JUNCTA IN UNO'(Latin for “Three joined in one”), a reference to the union of England, Scotland and Ireland and symbolised by the three crowns of the Order. This in turn is flanked by two laurel branches, enamelled green, above a scroll bearing the words ICH DIEN (old German for “I serve”) in gold letters. The crimson ribbon is 38 mm wide for all three classes. No clasps or bars are associated with this Order. The origins of the fourth highest order of chivalry in England the title of the Order date back to 1399, it arose from the ritual washing (inspired by the ritual of baptism), a symbol of spiritual purification, followed by a night of prayer and meditation before the Knights of the Bath attended the mass and then receive there accolade. Medieval knights frequently carried out there vigil of fasting, prayer and purification in the Chapel Royal of St John the Evangelist in the Tower of London. It was established by King George I by letters patent under the Great Seal dated 18 May 1725, with one class and one division. The Dean of Westminster was made Dean of the Order in perpetuity and King Henry VII Chapel designated as the Chapel of the Order. This patent specifically recalls how in former times ‘upon special occasions a ‘Degree of Knighthood, which hath been denominated the Knighthood of the Bath’, has been conferred’. In 1815, the decision was formally taken to abolish the ancient rites of bathing, vigils and the other preparations for installation to the Order. From the reign of King James I a special badge with three crowns was appropriated to the Knights of the Bath representing the three kingdoms of England, Scotland and Ireland. At the end of the Napoleonic Wars, the Prince Regent later to be King George IV found it necessary to reward many of the distinguished Army and Naval Officers and extend membership of the Order by creating a civilian division for exemplary civilian merit. It was awarded to military personnel during both World Wars. Awarded for having a prominent but lesser role at national level, or a leading role at regional level and for a distinguished, innovative contribution to any area. Awarded to G/Cpt Josef Berounský, G/Cpt Josef Duda, G/Cpt Alois Kubita, S/Ldr Karel Ruckl and G/Cpt Josef Schejbal. The CBE award is the Commander class of the Order of the British Empire and is the mid-rank of the order and is generally awarded for outstanding work in an individual’s respective field. The CBE is a 50 mm cross patonce (four arms, each arm growing broader and floriated toward the end) of silver-gilt with the arms enamelled pale blue crosses and crimson rings. The Imperial Crown is mounted to the upper arm. The obverse has a gold circular centre showing the crowned effigies of King George V and his consort Queen Mary. The centre is surrounded by a circular band, enamelled crimson and bearing the motto FOR GOD AND THE EMPIRE in gold. On the reverse is a rope circle with the current Royal Cypher, with a hallmark on the lower arm. The cross is suspended by a crown and a ring. Since 1937, the civil ribbon is rose-pink flanked by narrow pearl grey edges whilst the military ribbon has an additional central narrow stripe of pearl grey. The Order of the British Empire is the order of chivalry of the British democracy. 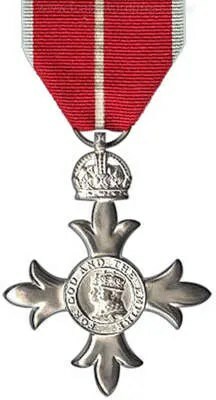 The order was created in 1917 by George V as he recognised the necessity for a new award of honour which could be more widely awarded, in recognition of the large numbers of people in the British Isles and other parts of the Empire who were helping the war effort both as combatants and as civilians on the home front. For the first time, women were included in an order of chivalry, and it was decided that the Order should also include foreigners who had helped the British war effort. From 1918 onwards there were Military and Civil Divisions, as George V also intended that after the war the Order should be used to reward services to the State, defined in a much wider sense to acknowledge distinguished service to the arts and sciences, public services outside the Civil Service and work with charitable and welfare organisations of all kinds. The Military Division of the Order of the British Empire recognises distinguished service in the field or before the enemy or for services to the Empire (Commonwealth). Awarded to W/Cmdr Ján Ambruš, W/Cmdr Jaroslav Hlaďo, S/Ldr Miloš Provazník and W/Cmdr Ferdinand Secký. The OBE award is the Officer class of the Order of the British Empire and is the second rank of the order and is the one that those who have performed very worthy service are admitted to. The Military Division was awarded to commissioned officers and warrant officers in respect of distinguished service in action. The post 1936 (current) badge is a 50 mm gilt with a cross patonce (four arms, each arm growing broader and floriated toward the end), with the Imperial Crown to the top arm. The reverse has the royal and imperial cyphre GRI surmounted by a crown, the whole enclosed in a cable circle, with a hallmark on the lower arm. From December 1918 onwards there were Military and Civil Divisions, as George V also intended that after the war the Order should be used to reward services to the State, defined in a much wider sense to acknowledge distinguished service to the arts and sciences, public services outside the Civil Service and work with charitable and welfare organisations of all kinds. Awarded to W/Cmdr Vladimír Nedvěd and S/Ldr Arnošt Fantl. 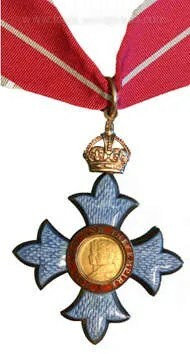 The MBE award is the Member class of the Order of the British Empire and is the first rank of the order. Usually awarded to an army officer of the rank of Major, Captain or Lieutenant as a reward for their loyal service. 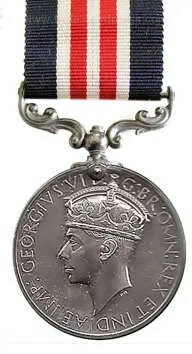 From 1940 the Sovereign could appoint a person as a Commander, Officer or Member of the Order of the British Empire for gallantry, for acts of bravery (not in the face of the enemy) which ranked below the level required for the George Medal, with the grade being determined by the same criteria as usual and not by the level of gallantry. The MBE is a 50 mm cross patonce (four arms, each arm growing broader and floriated toward the end) of silver-gilt. The Imperial Crown is mounted to the upper arm. The obverse has a circular centre showing the crowned effigies of King George V and his consort Queen Mary. The centre is surrounded by a circular band, enamelled crimson and bearing the motto FOR GOD AND THE EMPIRE in gold. Vladimír Nedvěd‘s MBE was the only one awarded to a Czechoslovak airman for bravery. On the night of 16/17 December 1940, on only his second operational mission, he was a navigator with a rank of P/O in a 311 Sqn Wellington T2577 (KX-Q) that took-off from East Wretham for a bombing raid of Manheim, Germany. After take-off, at an altitude of about 100 feet, whilst doing its primary circuit of the airfield, the aircraft’s wing-tip clipped some tree tops, heeled over, crashed into the ground a short distance from the airfield and the port engine burst into flames. P/O Nedvěd was uninjured in the crash and managed to escape from the aircraft, finding the co-pilot, who had been thrown from the aircraft in the crash, injured near the aircraft, he dragged him away to safety. Despite the aircraft being engulfed in flames, causing its armaments to exploded, on hearing that cries from the tail-gunner who was trapped in the rear gun-turrett, Nedvěd return to the aircraft to try and rescue him. For this act of bravery, Air-Vice-Marshall John Baldwin, Air Officer Commanding No 3 Group Bomber Command recommended that Vladimír be awarded the George Cross. 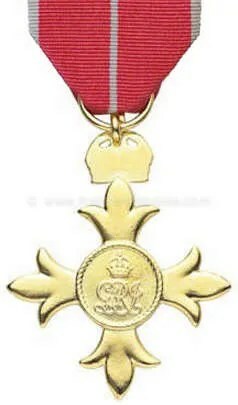 However the Honours Committee at the Air Ministry deceided that the ‘case’ fell short of the required criteria for the award of a George Cross and instead approved the award of a George Medal. It was then pointed out to the Selection Committee that the Member of the British Empire medal came next the the George Cross. A gold cross, with curved edges, overlaid in white enamel. The obverse of the medal has at the centre of the cross a raised laurel wreath, enamelled green, surrounding the Imperial Crown in gold, on a red enamelled background. The reverse has a similar raised centre with the laurel wreath surrounding the Royal Cypher ‘VRI’. The suspender is decorated with laurel leaves, and a bar of the same design is positioned at the top of the ribbon. Crimson flanked by narrow dark blue stripes at the edges. A gold bar ornamented by the Crown may be issued to DSO holders performing a further act of such leadership which would have merited award of the DSO. The Distinguished Service Order was instituted originally to reward junior officers in the Army for distinguished service or acts of gallantry against the enemy. While the Order of the Bath had been available for senior officers and the Distinguished Conduct Medal for the other ranks, no award below the level of the Victoria Cross (VC) had existed for junior officers. The DSO was also made available to junior officers of the other services. Six DSO’s were awarded to Czechoslovak airmen during WW2. 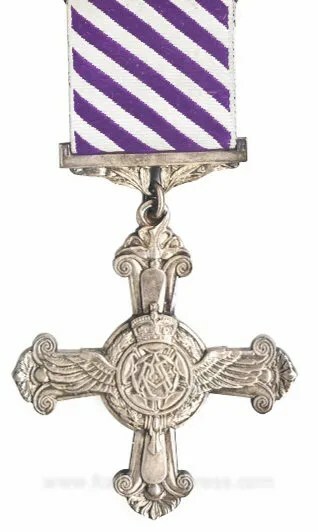 The Distinguished Flying Cross is a military decoration awarded to personnel of the United Kingdom’s Royal Air Force and other services, and formerly to officers of other Commonwealth countries, for “an act or acts of valour, courage or devotion to duty whilst flying in active operations against the enemy”. A cross flory 54 mm wide, in silver, the horizontal and base bars terminating in bombs, the upper bar in a rose. This cross is surmounted by another, composed of aeroplane propellers, charged in the centre with a roundel within a laurel leaf, from which 2 wings stretch across the horizontal bars. Imperial Crown. The reverse of the cross has at its centre an encircled Royal Cypher above the year ‘1918’. The medal is issued named. Alternate narrow diagonal stripes of white and deep purple. A silver bar ornamented by an eagle may be issued to DFC holders performing a further act of such valour which would have merited award of the DFC. Designed by Edward Carter Preston and instituted in 1918, the Distinguished Flying Cross was issued for acts of valour while flying in operations against the enemy to warrant officers and officers of the RAF. It was later made available to equivalent ranks in the Royal Navy and British Army for acts of valour in the air. During the Second World War, 20,354 DFCs were awarded, the most of any award, with approximately 1,550 first bars and 45 second bars. Honorary awards were made on 964 occasions to aircrew from other non-commonwealth countries. The equivalent award for the other ranks for acts of valour in the air on operations against the enemy was the Distinguished Flying Medal (DFM), instituted at the same time as the DFC and which was also later made available to other ranks of the Royal Navy and British Army. A total of 57 DFC’s were awarded to Czechoslovak airmen during WW2. F/Lt Karel Kuttelwascher, the third most successful Czechoslovak fighter pilot of the war achieving the distinction of being the only Czechoslovak airman to be awarded a bar to his DFC during WW2. Three other Czechoslovak airmen, F/Lt Slavomil Janáček, S/Ldr Alois Šedivý and F/Lt Jan Alexander, achieved the distinction of being awarded DFM’s whilst at the rank of NCO and later also being awarded DFC’s when they were officers. 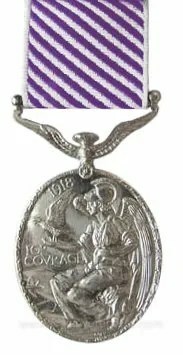 The Distinguished Flying Medal was (until 1993) a military decoration awarded to personnel of the Royal Air Force (United Kingdom) and the other services, and formerly also to personnel of other Commonwealth countries, below commissioned rank, for “an act or acts of valour, courage or devotion to duty whilst flying in active operations against the enemy”. A bomb with two wings attaches the medal to the ribbon. The ribbon is 32 mm wide, and consists of alternate violet and white stripes (1/16 inch wide) leaning 45 degrees to the left. A violet stripe is to appear in the bottom left and upper right corners when viewed on the wearer’s chest. with an eagle in the centre. The medal was established on 3 June 1918. It was the other ranks’ equivalent to the Distinguished Flying Cross, which was awarded to commissioned officers and Warrant Officers (although WOs could also be awarded the DFM), although it ranked below the DFC in order of precedence, between the Military Medal and the Air Force Medal. Recipients of the Distinguished Flying Medal are entitled to use the post-nominal letters “DFM”. In 1993 the DFM was discontinued, and since then the Distinguished Flying Cross has been awarded to personnel of all ranks. During World War II, 6,637 DFMs were awarded, with 60 second award bars. Some 165 were awarded to aircrew from other non- Commonwealth countries. Fifteen DFM’s were awarded to Czechoslovak airmen during WW2. Sgt Josef František, flying with 303 Sqn (Polish) during the Battle of Britain was the only Czechoslovak to be awarded a bar to his DFM during WW2, 11/9/40 and 4/10/40. Three other Czechoslovak airmen, F/Lt Slavomil Janáček, S/Ldr Alois Šedivý and F/Lt Jan Alexander, achieved the distinction of being awarded DFM’s whilst at the rank of NCO and later also being awarded DFC’s when they were officers. All ranks of the Royal Navy, Royal Marines, Army and RAF in recognition of exemplary gallantry in the air on non active operations. 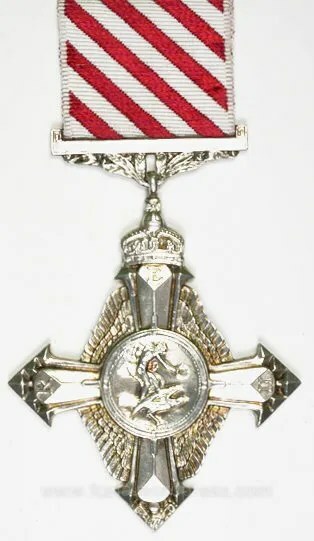 A cross, in silver, the obverse (shown here) made up of a thunderbolt surmounted by another cross of aeroplane propellers, the ends of which are inscribed with the letters of the Royal Cypher, the base bar terminated with a bomb and the top bar by the Imperial Crown, with the arms conjoined by wings. A central roundel depicts Hermes mounted on a hawk in flight bestowing a wreath. The reverse bears the image of the Royal Cypher above the date ‘1918’. Alternate narrow diagonal stripes of white and crimson. A silver bar ornamented by an eagle may be issued to AFC holders performing a further act of such gallantry which would have merited award of the AFC. Instituted in 1918, the Air Force Cross (AFC) was issued for acts of gallantry while flying on non active operations to warrant officers and officers of the Royal Air Force (RAF). It was later made available to equivalent ranks in the Royal Navy (RN) and Army for acts of gallantry in the air. Following the 1993 review, the AFM was discontinued and the AFC became available to all ranks of all services for exemplary gallantry in the air not in presence of the enemy. It is at the same level as the Queen’s Gallantry Medal, which is awarded for the same degree of gallantry on land or at sea. 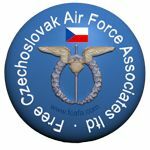 Seven AFC’s were awarded to Czechoslovak airmen during WW2. The Air Force Medal was (until 1993) a military decoration awarded to personnel of the Royal Air Force (United Kingdom) and other services, and formerly also to personnel of other Commonwealth countries, below commissioned rank, for “an act or acts of valour, courage or devotion to duty whilst flying, though not in active operations against the enemy”. The reverse shows Hermes (facing right) is shown, mounted on a hawk in flight and bestowing a wreath, all contained within a laurel wreath. The date 1918 appears behind Hermes on the King George VI and Queen Elizabeth II medals. and white stripes (1/16″ wide) leaning 45 degrees to the left. right corners when viewed on the wearer’s chest. The medal was established on 3 June 1918. It was the other ranks’ equivalent to the Air Force Cross, which was awarded to commissioned officers and Warrant Officers (although WOs could also be awarded the AFM), but ranked below it in order of precedence, between the Distinguished Flying Medal and the Queen’s Gallantry Medal. 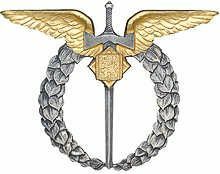 The AFM was awarded 259 times during WW2, three of which were awarded to Czechoslovak airmen. Recipients of the Air Force Medal are entitled to use the post-nominal letters “AFM”. In 1993, the AFM was discontinued, and since then the Air Force Cross has been awarded to personnel of all ranks. Awarded to all ranks of the Royal Navy, Royal Marines, Army, and RAF in recognition of exemplary gallantry during active operations against the enemy on land. An ornamental cross in silver, with straight arms terminating in broad finals ornamented with Imperial Crowns. At the centre on the cross is the Royal Cypher (King George VI shown here). The reverse of the cross is plain in design, though at certain times the year of the award has been engraved. A central stripe of deep purple flanked by equally sized stripes of white. 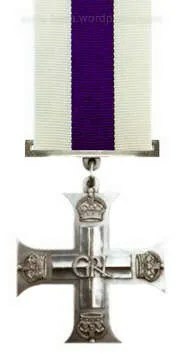 A silver bar ornamented by the Crown may be issued to MC holders performing a further act of such gallantry which would have merited award of the MC. Instituted in 1914, the Military Cross was issued for gallantry in presence of the enemy to warrant and junior officers of the Army who were ineligible (on account of their rank) for the Distinguished Service Order. During World War 1 it was also available to equivalent ranks in the Royal Naval Division and Royal Marines (RM) and it later became available to equivalent ranks in the RAF for acts of gallantry on land. Not a usual gallantry medal to be awarded to a Czechoslovak airman, the MC awarded to F/O Vilém Kauders was whilst he was serving with the Czechoslovak Army in North Africa in WW2, prior to him volunteering for transfer to 311 Sqn RAF. A circular silver medal of 36 mm diameter. The obverse bears the effigy of the reigning monarch. The reverse has the inscription “FOR BRAVERY IN THE FIELD” in four lines, surrounded by a laurel wreath, surmounted by the Royal Cypher and Imperial Crown. The suspender is of an ornate scroll type. The ribbon is dark blue, 31.75 mm wide, with five equal centre stripes of white, red, white, red, and white (3.17 mm each). The medal was established on 25 March 1916. 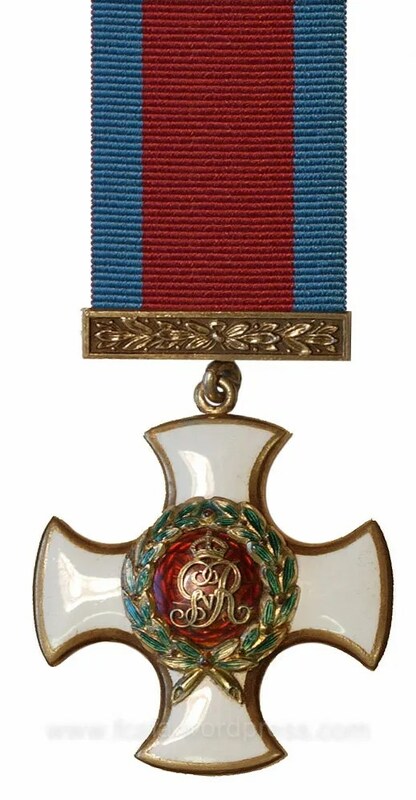 It was the other ranks’ equivalent to the Military Cross (MC), which was awarded to commissioned officers and, rarely, to warrant officers, although WOs could also be awarded the MM. The MM ranked below the Distinguished Conduct Medal (DCM), which was also awarded to non-commissioned members of the Army. Recipients of the Military Medal are entitled to use the post-nominal letters “MM”. Over 115,000 awards were made for actions during the First World War. Additionally, over 5,700 bars were awarded, as well as 180 second bars. There was one instance of a third bar being awarded; this was made to Private Ernest Albert Corey, who served as a stretcher bearer in the Australian 55th Infantry Battalion, which served on the Western Front. During the Second World War, over 15,000 awards of the MM were made. The decoration has occasionally been bestowed upon non British or Commonwealth subjects, and has also been awarded to some civilians, with the first such awards being made to two female civilians for actions during the Easter Rising in 1916. In 1993, the Military Medal was discontinued. Since then the Military Cross has been awarded to personnel of all ranks within the British honours system. Several Commonwealth nations, such as Australia, New Zealand and Canada, have established their own honours systems in the post Second World War era and now award their own gallantry decorations. Not a usual gallantry medal to be awarded to a Czechoslovak airman, the MM awarded to Sgt Karel Hájek whilst serving with the Czechoslovak Army in North Africa in WW2, prior to him volunteering for transfer to the RAF. Below lists the order of precedence for British campaign medals of World War 2. * not applicable for Czechoslovak RAF personnel as this was not a war theatre the served in. It was decided that the maximum number of stars that could be earned by one person was five, while those who qualified for more received a clasp to be sewn on the ribbon of the appropriate star. Only one clasp per ribbon was permitted. Clasps are usually referred to as ‘bars’. They are single-faced metal bars carried on a ribbon attached to the medal, indicating the recipient’s service in a particular campaign or battle. Usually the first earned Clasp is closest to the medal, so that the latest earned should be at the top. Due to the different date ranges, it is not possible to have a Aircrew Europe clasp to a France and Germany Star. The 1939 to 1945 Star was awarded for any period of operational service overseas between 3 September 1939 and 8 May 1945 (2 September 1945 in the Far East). The criteria is 180 days’ service between these dates, although some special criteria apply when, at certain specified times, just 1 days’ service is required. RAF air crew qualify with 60 days service in an operational unit including at least one operational sortie. The star was immediately awarded if the service period was terminated by death, disability or wounding. The award of a gallantry medal or a Mention in Despatches also led to an immediate award. The 1939–45 Star is a six–pointed star of yellow copper zinc alloy, with a height of 44mm and maximum width of 38mm. The obverse has a central design of the Royal Cypher, surmounted by a crown. The cypher is surrounded by a circlet containing the words ‘The 1939–1945 Star’. The ribbon has three vertical stripes of dark blue, red and light blue. The dark blue stripe represents the Naval Forces and the Merchant Navy, the red stripe the Armies and the light blue stripe the Air Forces. The three equal bands representing the equal contributions towards victory of the Royal Navy, Army, and the Royal Air Force respectively. Worn with the dark blue stripe furthest from the left shoulder. Air crew of fighter aircraft engaged in the Battle of Britain between 10 July and 31 October 1940, in a qualifying squadron, were awarded the clasp ‘Battle of Britain’ to be worn on the ribbon of the 1939 to 1945 Star. In undress uniform, a silver-gilt rosette was worn on the medal ribbon to denote the award of this clasp. The long overdue recognition for the airmen who had served in Bommber Command only came on 26 February 2013 when a Bomber Command Clasp was announced. It is granted to the aircrew of Bomber Command who served for at least 60 days, or completed a tour of operations, on a Bomber Command operational unit and flew at least one operational sortie on a Bomber Command operational unit from the 3 September 1939 to the 8 May 1945 inclusive. This applies to servicemen after they have met the minimum qualification for the 1939-45 Star, which in many cases, though not exclusively, is 60 days. Airmen must have already qualified for the 1939-45 Star before their time can count toward the required 60 day qualification period for the Bomber Command Clasp. Eligibility to the Bomber Command Clasp has no effect upon eligibility for World War 2 recognition previously awarded and does not suggest automatic eligibility for any further awards. 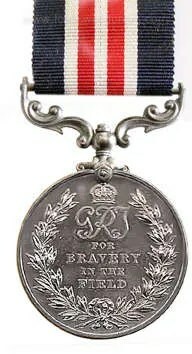 The ribbon for this medal, along with those of the other Second World War campaign stars, is reputed to have been designed by King George VI. The Star campaign medals were designed by the Mint engravers. Sometimes mistakenly referred to as the ‘Victory medal’. The Atlantic Star is a campaign medal of the British Commonwealth that was awarded for operational service in British waters and the Atlantic within the period 3 September 1939 to 8 May 1945. Due to British uniform regulations, neither the France and German Star nor the Air Crew Europe Star would be worn by a recipient of the Atlantic Star. RAF air crew qualified after the award of the 1939 to 1945 Star for an additional 60 days service in an operational unit having taken part in operations against the enemy at sea within the specified area. The star was immediately awarded if the service period was terminated by death, disability or wounding. The award of a gallantry medal or a Mention in Despatches also led to an immediate award. The Atlantic Star is a six–pointed star of yellow copper zinc alloy, with a height of 44mm and a maximum width of 38mm. The obverse has a central design of the Royal Cypher of King George VI, surmounted by a crown. The cypher is surrounded by a circlet containing the words ‘The Atlantic Star’. The reverse is plain, although Stars issued to Australian and South African personnel have recipient names impressed. Shaded and watered stripes of blue, white and green to represent the Atlantic. Worn with the blue edge furthest from the left shoulder. Regulations only allow one clasp to be worn with the Star. When the ribbon is worn alone a silver rose emblem on the ribbon of the first star when wearing the ribbons without the medals attached. However due to the recipient being only allowed to wear one emblem there is no way of telling whether they qualified for the Air Crew Europe or France Germany Star as the pattern is the same for both. British uniform regulations stipulated that neither the Air Crew Europe Star nor the France and Germany Star would be awarded to a recipient of the Atlantic Star. Subsequent entitlement to the Air Crew Europe Star or the France and Germany Star was denoted by the award of the appropriate clasp to the Atlantic Star. When the Atlantic Star is worn the appropriate clasp can be fitted to the ribbon with the title ‘Air Crew Europe’ or ‘France and Germany’, however regulations state that only the first clasp earned can be worn with the medal. Atlantic Star with Air Crew Europe clasp. The Battle of the Atlantic took place between 3 September 1939 and 8 May 1945 as German U boats attacked the convoys transporting valuable supplies from America and the colonies to Britain. Battleships of the Royal Navy and aircraft of the RAF escorted the convoys, hunted the U boats and despite some notable successes by the U boats, the Allies won a comprehensive victory in the Atlantic. The Air Crew Europe Star is a campaign medal of the British Commonwealth that was awarded for aircrew operations over Europe in World War 2 between 3 September 1939 and 2 September 1944. The Air Crew Europe Star was earned almost exclusively by RAF personnel and can only be awarded after the 1939 to 1945 Star has been qualified for. The Air Crew Europe Star was awarded for 60 additional days’ service in an RAF Unit engaged in operational flying over Europe from bases in the UK with at least one operational sortie. After 5 Jun 44, operational flying over Europe qualified aircrew for the France and Germany Star. Non-aircrew personnel had to complete 6 months service in an area of operational army command. The Air Crew Europe Star is a six–pointed star of yellow copper zinc alloy, with a height of 44mm and a maximum width of 38mm. The obverse has a central design of the Royal Cypher of King George VI, surmounted by a crown. The cypher is surrounded by a circlet containing the words ‘The Air Crew Europe Star’. A wide central stripe of light blue, flanked at the edges by narrow stripes of yellow and black to symbolise the continuous service of the Air Force by night and day. Regulations only allow one clasp to be worn with the Star. When the ribbon is worn alone a silver rosette ribbon emblem is worn to denote the award of a clasp. Air Crew Europe Star with Atlantic and France & Germany clasps. For aircrew operations over Europe in World War 2. The strategic bombing campaign against German industrial cities, military installations, and a wide variety of other targets continued throughout the War and made a decisive contribution to Allied victory. The RAF endured significant losses of both men and aircraft but by the end of the War the campaign had severely curtailed German industrial production and virtually immobilised her military power. 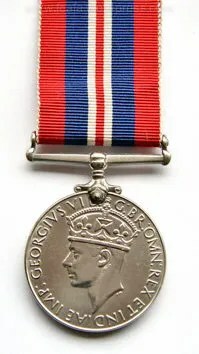 The ribbon for this medal, along with those of the other Second World War campaign stars, is reputed to have been designed by King George VI, with the three equal bands representing the equal contributions towards victory of the Royal Navy, Army, and the Royal Air Force respectively. The Star campaign medals were designed by the Mint engravers. Service with either the 1st or 8th Army in North Africa during certain specified dates qualify for award of the ‘1st Army’ or ‘8th Army’ clasp to be worn on the ribbon of the Africa Star. The Africa Star is a six–pointed star of yellow copper zinc alloy, with a height of 44mm and a maximum width of 38mm. The obverse has a central design of the Royal Cypher of King George VI, surmounted by a crown. The cypher is surrounded by a circlet containing the words ‘The Africa Star’. The reverse is plain, with no naming. Pale buff to symbolise the desert, overlaid with a central red stripe and one narrow stripe each of dark and light blue to represent the 3 services. Worn with the dark blue stripe furthest from the left shoulder. There were 3 clasps for this medal: 8th Army, 1st Army and North Africa 1942-43. Only one bar could be worn on the medal. If a recipient was entitled to more than one clasp, they wore the first clasp gained. In North Africa, British forces fought against the Germans and Italians between 10 June 1940 and 12 May 1943. Italy entered the war in July 1940 when their forces invaded British colonies in East Africa. When the British fought back Germany sent troops to help the Italians. The British were then weakened after sending forces to aid Greece and German forces advanced, taking control of large areas of Egypt, Libya and Tunisia. The desert conflict continued with the balance of power shifting between the 2 sides until the British eventually secured victory on 12 May 1943 when the remaining German forces surrendered at Tunis. The Star campaign medals were designed by the Mint engravers. This medal was awarded for 1 days operational service in Sicily, Italy or Yugoslavia during the period 11th June 1943 to 8th May 1945. 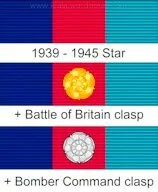 The Star was awarded to those who have earned it whatever other Campaign Stars may be granted in addition for services in WW2. The Italy Star is a six–pointed star of yellow copper zinc alloy, with a height of 44mm and a maximum width of 38mm. The obverse has a central design of the Royal Cypher of King George VI, surmounted by a crown. The cypher is surrounded by a circlet containing the words ‘The Italy Star’. The reverse is plain and issued unnamed by the British Government. 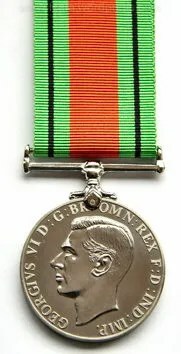 The ribbon for this medal is 32mm wide and, along with those of the other Second World War campaign stars, is reputed to have been designed by King George VI. Equal width stripes of red, white, green, white and red represent the colours of the Flag of Italy. There were no clasps awarded with the Italy Star. After victory in North Africa, the Allies used the position of Tunisia and Malta to invade Sicily. This campaign in Sicily took place from 10 July 1943 to 17 August 1943. After this swift victory, the Allies pressed on into Italy, with this campaign beginning on 3 September 1943, and also invaded Italian occupied Greece, Yugoslavia, Corsica and Sardinia. The campaign in Italy itself continued to the end of the war in Europe on 8 May 1945. 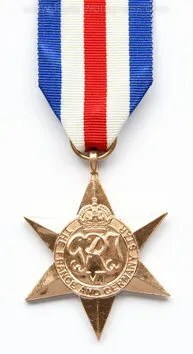 The Burma Star was a campaign medal of the British Commonwealth, awarded for 1 or more days service in Burma between 1941 to 1945. RAF air crew engaged in operations against the enemy will also qualify provided that at least one operational sortie has been completed. Those serving in Bengal and Assam (in India), China, Hong Kong, Malaya or Sumatra between other specified dates will also qualify. The Burma Star is a six–pointed star of yellow copper zinc alloy, with a height of 44mm and a maximum width of 38mm. The obverse has a central design of the Royal Cypher of King George VI, surmounted by a crown. The cypher is surrounded by a circlet containing the words ‘The Burma Star’. Dark blue overlaid with a central red stripe to represent the Commonwealth Forces and 2 narrow stripes of orange to symbolise the sun. There were no clasps awarded with the Burma Star. The campaign in Burma took place between 11 December 1941 and 2 September 1945, during which time the Japanese invaded Burma, driving British forces to the Indian border. As the Japanese held superiority in the Pacific it wasn’t until early in 1944 that the Allies were in a position to strike back and regain a foothold in Burma with the aim of finally defeating the Japanese in the Pacific and Far East. Total surrender of the Japanese came on 2 September 1945 following the dropping of the atom bombs by the Allies on 2 Japanese cities. PoWs were forced to labour on construction projects such as railway building (as depicted in the film ‘The Bridge on the River Kwai’) and were frequently tortured and starved. Around 13,000 British soldiers and 2,000 civilians died in Japanese wartime camps. 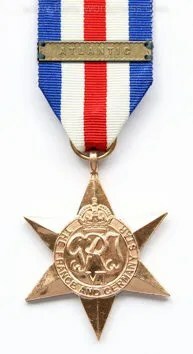 The France and Germany Star was a campaign medal of the British Commonwealth, awarded for operational services in France, Belgium, the Netherlands and Germany between June 6th, 1944 (D-Day) and the May 8th, 1945, the German surrender and end of hostilities in Europe. Air Force aircrew had to make one operational sortie over Europe within the above dates and appropriate land or sea areas. Personnel who flew operations over Europe from Mediterranean bases did not qualify for this award either but for the Italy Star medal. British uniform regulations stipulated that neither the Atlantic Star nor the Air Crew Europe Star would be awarded to a recipient of the France and Germany Star. Subsequent entitlement to the Atlantic Star was denoted by the award of the Atlantic clasp. A clasp for the Air Crew Europe Star was not issued as that Star could not be earned after 5 June 1944. The Star was not awarded in addition to the Atlantic Star or the Air Crew Europe Star. If a candidate should qualify for these three Stars or two of them, the Star first earned will be awarded. If the France and Germany Star is awarded under these conditions a Clasp will be awarded for service which would qualify for the Atlantic Star. A silver rose Emblem will be worn to denote the award of this Clasp. The France and Germany Star is a six–pointed star of yellow copper zinc alloy, with a height of 44mm and a maximum width of 38mm. The obverse has a central design of the royal cypher of GRI VI with a crown positioned on the circlet at 12 o’clock. The cypher is surrounded by a circlet containing the words ‘The France and Germany Star’. Generally 32 mm wide with five equal stripes of (from left to right) blue, white, red, white and blue. These were chosen as being symbolic of the national colours of France, Netherlands, and the United Kingdom Union Flag. Being noted that Belgium is not represented. 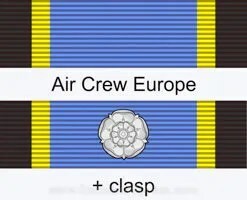 Due to the different date ranges, the combination of a Aircrew Europe clasp to a France and Germany Star is not possible. The Clasp with the title ‘Atlantic’ was awarded to the recipient qualifying for the France & Germany Star and the Atlantic Star. This was attached to the ribbon of the France and German Star to show service rendered. A second clasp to this Star was not awarded. France and Germany Star with Atlantic clasp. Concurrently to the campaigns in the Far East, the Allies were preparing for a final campaign in Northwest Europe. On 6 June 1944 (D-Day) British, American and Canadian forces landed on the beaches of Northern France. Over the next year the British, American and Canadian forces advanced across Western Europe, liberating German occupied France, Belgium and the Netherlands. At the same time the Russians advanced from the East, through German occupied Poland, Hungary, Slovakia and Austria towards Berlin. German forces surrendered when the Allies reached Berlin, bringing the war in Europe to an end on 8 May 1945. One of the two medals, the Defence Medal and the War Medal, which were issued in recognition of general service in World War 2. These are circular medals made in cupronickel. 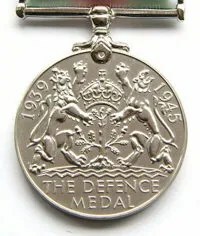 The Defence Medal was awarded for service in the forces in non-operational areas subjected to air attack or closely threatened for at least three years service in Great Britain until 8th May 1945 or one year in territories overseas until 2 September 1945. The type of service in the UK included those service personnel working in headquarters, on training bases and airfields and members of the Home Guard. The Defence Medal was also awarded for non operational service overseas, for example in India or South Africa. Overseas, non-operational but with close threat or air attack 180 days. The award has the uncrowned head of King George VI on the obverse. The reverse shows the Royal Crown resting above a small oak tree and flanked by two heraldic lions. The dates 1939 and 1945 appear in the top left and right respectively on the reverse, whilst beneath are the words ‘The Defence Medal’. The medal is made of a Cupro-Nickel combination. The light green ribbon is 31.75 mm wide with a central stripe of orange, which is 6.35 mm wide, and a narrow black stripe in the middle of each green stripe. The orange flame colour symbolise enemy attacks on Britain’s green and pleasant land and the black stripes represents the black-outs. 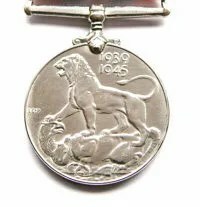 The War Medal 1939–1945 was awarded to all full time service personnel of the Armed Forces in recognition of general service in World War 2 wherever their service was rendered. The British issue of this circular medal is made of cupro-nickel and were issued unnamed. It is 36mm in diameter. The obverse shows the crowned head of King George VI, facing left, and the legend GEORGIVS VI D : BR : OMN : REX ET INDIAE IMP :. The reverse of the medal shows a lion standing on the body of a dragon. This dragon is double-headed, one of an eagle and one of a dragon to signify the principal occidental and oriental enemies. Above are the dates 1939 and 1945. In the colours of the union flag, the ribbon is 32mm wide with a narrow central red stripe flanked by narrow white stripes , wider blue stripes and then red. A single oak leaf emblem is worn to signify a “Mention-in-Despatches” and the silver oak leaf signifying a “King’s Commendation for Brave Conduct” is worn on the medal. There are no bars or clasps other than these emblems. The medal was established on 16 August 1945 and had been designed by Edward Carter Preston. Very nice review, thank you very much!